If you know about the therapeutic value of CBD or cannabidiol—from its stress relieving benefits to its potential to treat a wide range of medical conditions—the biggest question on your mind is probably not if you should take a CBD product, but rather, what kind you should take. The three most popular types of CBD product options are tinctures, vape oils and capsules. A couple of weeks ago, we shared more information about tinctures. This week, we are looking more closely at CBD vape oil to help you make an informed decision about whether or not you think it is best for you. What is a vape, and how does it work? Vaporizers or vape pens are a type of e-cigarette that heat up an oil cartridge and convert that oil into a vapor that can be inhaled. Since it heats the oil at a lower temperature, it does not create the detrimental combustion byproducts, such as the carcinogens that smoking does, which are the main culprits of both short and long term respiratory damage. 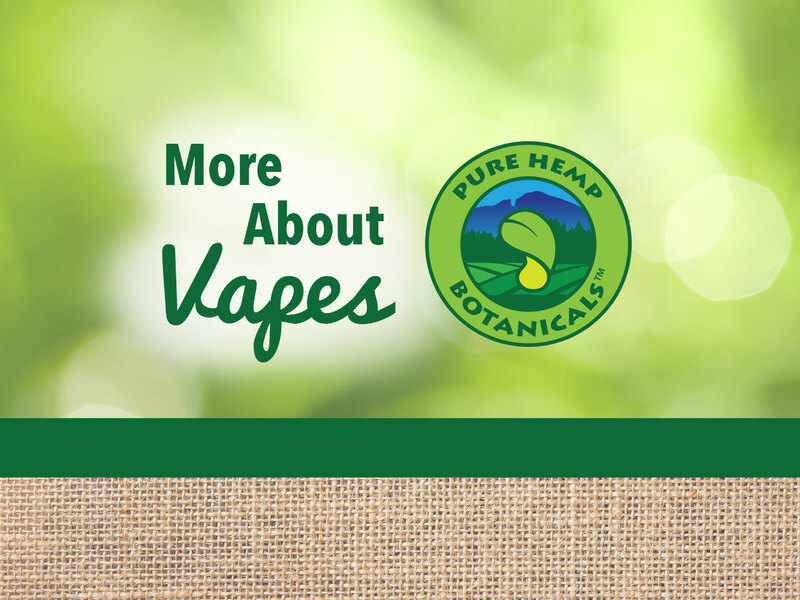 Pure Hemp Botanicals’ vape oil is currently offered in cartridges containing 250mg or 500mg of CBD. Our CO2 extracted oil is made from industrial hemp grown organically right here in Colorado. What are the advantages of using a CBD vape? Using a CBD vape oil is advantageous because it is fast acting and allows you more control over the dosage. The reason it is fast acting is because it is immediately absorbed by your body as you inhale it into your lungs. You determine how much you inhale at a time which gives you far more control over the dosage than you would have taking a CBD capsule. Isn’t vaping just as unhealthy as smoking? The biggest concern about vaping—whether you are using a CBD oil or nicotine infused oil—is whether or not it is safe. While the long term health effects of vaping are still to be discovered, there have been many studies on the effects of vaping that have concluded that it is a safer alternative than smoking. In studies that suggest potential hazards to vaping, artificial flavors are often the culprit. This is why Pure Hemp Botanicals has excluded this ingredient from our vape oil and only uses natural plant terpenes! Do you have any more questions about CBD vape oil that we can answer for you? If so, leave them in the comments for us!